These days, the internet has by large become an important organ system of our body. Most functions need internet connectivity. This has become possible with the internet being global and it can enable all the devices and people across that world to exchange data. Other equipment like household appliances, vehicles, etc. is not inherently made to leverage the capability of the internet. But things are changing these days, thanks to the ardent tech geeks who are continually working on improvising technology and making things easy for us. Internet of things has been a boom in the field which enables the conventional devices at home, connect to the internet and do things that probably we wouldn't think of. IoT is the interconnection of devices, vehicles and other systems embedded with electronics, software, network adapters, sensors and actuators which can globally interact among themselves to produce the exchange of data and information. For example: If you want your geyser to be turned on every day at 6 am, then enabling IoT integration would auto turn on the system every day. This will make the device smart. Biometrics is an advanced technology of providing authentication to the system access through a fingerprint scanner. This is one of the most sought after ways of having an attendance system in many Business organizations called IoT based biometric attendance system. 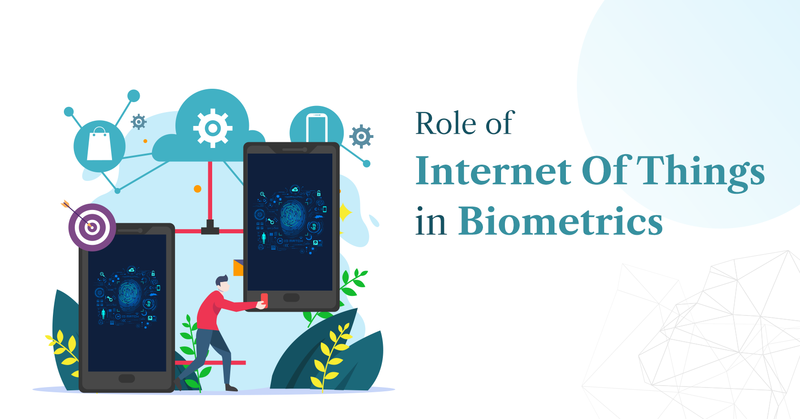 With the advancement in technology, the results have shown a better security standard implemented by coupling the Internet of Things with the Biometrics. It facilitates better encryption standards to raise the level of safety to these fingerprint scanning systems. The traditional methods of authentication through passwords will prove to be mediocre in the security levels. The objective with IoT integration is to ease the task of authentication by including a two-step authentication to the access, eliminating the conventional way of using login/passwords which creates the possibilities of sharing, forgotten or guessed. It can also compromise on the security of the IoT devices if the password is the same. Here are some of the applications of the intervention of IoT in biometrics. It helps in Payment solutions through app mode, Blockchain system, E-tracking systems, etc. It facilitates authorized, secured access into the system. Used for Home automation with IoT, Personal phone authentication and access, etc. It eases the retrieval of the patient's data without following an extensive search process. High-end monitoring of the guarded systems quickly. Comprehensive support system to aid, in case of an emergency. Personalized features by catering personally to the needs. A customized user interface to meddle with the software more efficiently to enhance the User experience. The smart security solutions offered will be affordable with complete satisfaction for the investment made. Detailed data analysis, procurement and report generation. It will be maintained in a database to facilitate the needs that may arise in the future. Real-time execution of biometric data collected for authentication of various procedures. Remote access to the system to control the data input and analysis, improving the horizon of work. Faster solutions than the organic method. Advanced alert systems entangled to Biometric systems for better monitoring. Increased security measures by implementing n-step authentication for best encryption and secured data delivery on the Universal standards. Complete data digitization for better integration of data into other digital systems. Multi-level authentication for hack-proof solutions. Go password-less for the implementation of Biometric security systems. No more requirement of remembering cumbersome passwords. Modular segregation of the biometric techniques from the core operations to differentiate between the malicious functions and the authentication functions. Authentication is done for the smart device. Modularity of the same between user's device and smart device provides decentralization of security factors. Reduces time complexity significantly and eases the authentication process to a large extent. One step solution for all the needs. Greater ease of validation of the data obtained. The biometric data collected can be maintained in the database temporarily or permanently and can be used for mapping according to the security needs. Modularisation ensures the safety of the data obtained and processed at each level, providing a shield against data hacking. Replicating biometric password is much more difficult than reproducing the traditional passwords. This becomes an important factor in enhancing security. Personalized security features help create various security standards. Compatibility with multiple platforms creates a much favorable response from the user end. The use of internet in Biometrics, make the system work more smartly with respect to the data analysis, processing, and segregation. The data thus procured in the process of scanning will be available for use from isolated areas and hence can enable the 24/7 support system in case of any necessity. A one-step failure of any particular module will cause the crashing of the whole system if the proper modularity is not maintained. Defective scanning system or the improper functioning of the sensor can lead to physical hazards. Incorrect authentication device or corrupted software can lead to a loss/breach of data. Inadequate knowledge of the working of IoT device with the biometrics can cause the loss of data. The remote authentication can sometimes turn to be fatal as it can provide the access and control of the IoT biometric to the person who might not be authenticated personnel to operate. Thus implementing IoT on the Biometric IoT, fingerprint sensors work a great deal in handling the new age challenges. IoT based attendance monitoring system is more advanced in terms of having a superior way of authentication and ease of implementation. The improvement in technology has thus played a very effective role in ensuring data security, user experience, and remote accessibility. This has strengthened the traditional Biometrics in all the senses.